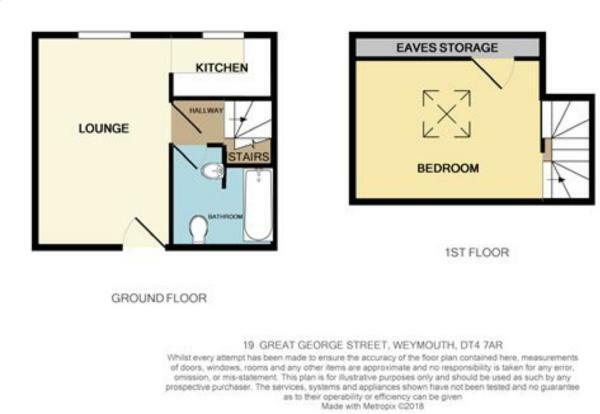 This ONE DOUBLE BEDROOM DUPLEX APARTMENT is located within close proximity to the TOWN CENTRE and Weymouth’s award winning beach which makes this an IDEAL FIRST TIME BUY/INVESTMENT PURCHASE. This second floor apartment offers LOUNGE, kitchen, bathroom and a DOUBLE MASTER BEDROOM with eave storage. Offered with NO FORWARD CHAIN high demand is expected so PLEASE CALL THE OFFICE ON 01305 778500. Bathroom – 7’0 x 6’1 (2.13m x 1.85m) – Pedestal hand wash basin, low level WC, panel enclosed bath, central ceiling light, partially tiled, extractor fan, shaving point. 1st Floor Bedroom – 16’10 x 7’11 (5.13m x 2.41m) – Front aspect double glazed Velux window, power points, central ceiling light x 2, electric storage heater, BT point, door leading to eaves storage.